Aneurysmal bone cyst (ABC) is a rare benign osteolytic bone neoplasm of the bone tissue, characterized by several sponge-like blood- or serum-filled, generally non-endothelialized spaces of various diameters that may contain osteoid tissue and osteoclast-like giant cells. , The ABCs are infrequent in craniofacial skeleton with regard to other structures like long bones and the spine; only 2% of the ABCs occur in the jaws. The mandible is more frequently affected than the maxilla, with a proportion from 11:9 to 2:1. , The body (90% of the cases) and the mandibular ramus (30%) are the main locations, with rare incidences reported in the coronoid process and the mandibular condyle (2%). It represents approximately 1.5% of all non-odontogenic and non-epithelial cysts of the jaws. , ABC can be classified into three types. Conventional or vascular type presents as an expansile, rapidly growing destructive lesion causing cortical perforation and soft tissue invasion. The solid type may reveal as a small asymptomatic lesion that is first noticed as radiolucency on routine radiograph or as a small swelling clinically. , The third form or mixed variant exhibits features of both the vascular and solid types. It may be a transitory phase of the lesion because sudden activation or rapid enlargement of stable lesions has been reported. 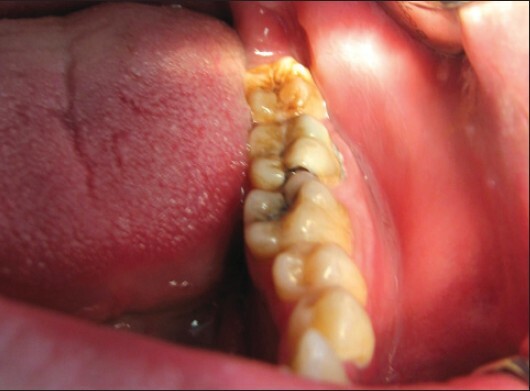 In this article, we describe a case of ABC in the mandibular corpus region with its clinical, radiological, and pathological findings. Also, a review of the literature has been presented. A 23-year-old male patient presented to our clinic with the complaint of a mild pain on the left posterior lower jaw since 2 months. His medical and family history was unremarkable and there was no history of trauma [Figure 1]. There was no evidence of swelling and sensitivity with palpation on extraoral and intraoral examination. Absence of symptoms like fever or suppuration eliminated infection. The patient had a dental examination at a dental hospital a week ago; a panoramic radiograph [Figure 2] was taken and he was directed to our clinic for treatment. 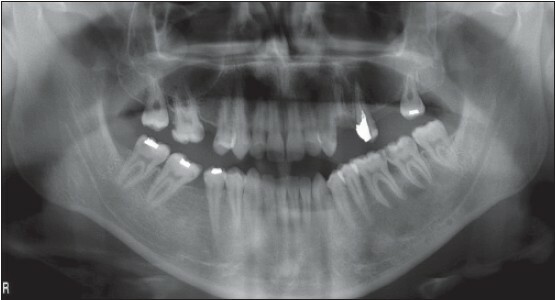 Panoramic radiograph of the patient revealed a unilocular, circular radiolucent lesion with well-defined borders on the left mandible. The superior margin of the lesion was extending between the apical third portions of the roots of the teeth 35-38. Cone beam computed tomography (CBCT) (Planmeca ProMax 3D Mid; Planmeca, Helsinki, Finland) was performed. CBCT slices revealed an expansile lesion with a diameter of 27 × 18 × 12 mm. 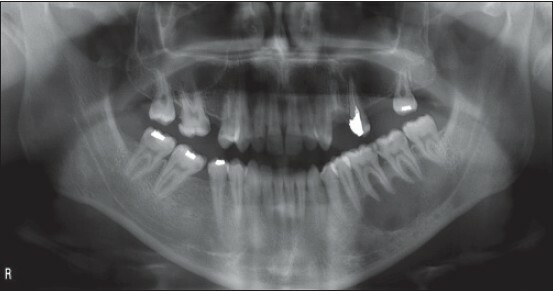 The lesion had a hydraulic-appearing outer margin above the mandibular canal [[Figure 3] a-c]. The panoramic radiograph and CBCT cross-sectional slices demonstrated no displacement or root resorption of the teeth. Electrical pulp test showed that the involved teeth were vital. Fine-needle aspiration biopsy was performed and blood-tinged fluid was obtained, but it was nondiagnostic. Excisional surgical treatment was performed after raising a mucoperiosteal flap and was completed with curettage of lesion under local anesthesia. The flap was repositioned and sutured with silk 3/0. On gross examination, the excised tumor mass, which are pinkish gray and friable, consisted of some sclerotin. Prophylactic antibiotic as well as nonsteroidal anti-inflammatory drug were administered on the following days. 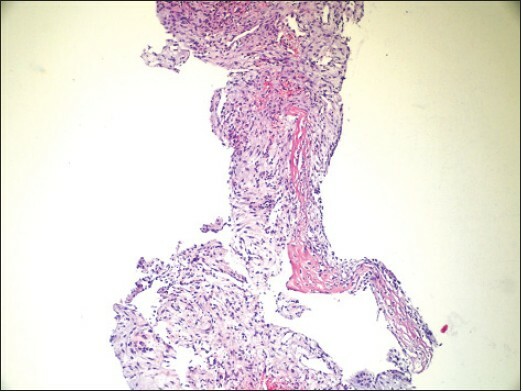 The histologic examination of excisional biopsy specimen revealed multiple blood-filled spaces separated by septa of fibrous tissue containing fibroblasts and multinucleated giant cells. Also, numerous small and large vascular spaces lined by endothelial cells and abundant pools of Red Blood Cells (RBC) were seen [Figure 4]. Thereby, diagnosis of ABC was confirmed by histopathologic evaluation. The patient was pain free after 6 months of follow-up, and panoramic radiography [Figure 5] showed no evidence of recurrence. Histologically, the ABC consists of many sinusoidal blood-filled spaces set in a fibrous stroma, with multinucleated giant cells and osteoid. Hemosiderin is present in variable amounts and there is evidence of osteoid and bone formation. The present case is consistent with the "classic or vascular" form described in the literature. Although there are many options concerning the treatment, the gold standard is surgical excision and curettage of the cavity. , Motamedi et al. also reported self-healing of cases on long-term follow-up. The usage of radiotherapy is not recommended because of the probability of radioinduced tumors. Recurrence rates range from 20 to 30% in different groups and it occurs most frequently within the first year after surgery. This is usually associated with insufficient excision or curettage of the lesion, especially in soft tissue invasive cases. 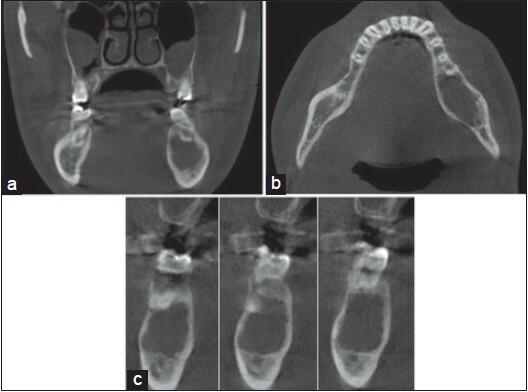 Several authors recommend immediate reconstruction of the defect with autogenous grafts in cases of aesthetic deformity and in cases with high risk of fractures and loss of mandibular continuity. Motamedi et al. reported that initial resection is not necessary and have not noted any recurrences following surgical curettage of mandibular lesions. There was no evidence of any residual lesion after 6 months of follow-up. In the present case, treatment of choice was limited to curettage of the mass and the patient was regularly monitored. As the radiologic and clinical presentation of ABC is extremely variable, a great emphasis is placed on histopathologic examination for the diagnosis. 1. Rosenberg AE, Nielsen GP, Fletcher JA. Aneurysmal bone cyst. In: Fletcher CD, Unni KK, Mertens F, editors. WHO Classification of Tumors: Pathology and Genetics of Tumors of Soft Tissue and Bone. 3 rd ed. Lyon: IARC Press; 2005. p. 338-9. 2. Jundt G. Aneurysmal bone cyst. In: Barnes L, Eveson JW, Reichart P, Sidransky D, editors. WHO Classification of Tumors: Pathology and Genetics of Head and Neck Tumors. 3 rd ed. Lyon: IARC Press; 2005. p. 326. 3. Bataineh AB. Aneurysmal bone cysts of the maxilla: A clinicopathologic review. J Oral Maxillofac Surg 1997;55:1212-6. 4. Martins WD, Fávaro DM. Aneurysmal bone cyst of the coronoid process of the mandible: A case report. J Contemp Dent Pract 2005;6:130-8. 5. Svensson B, Isacsson G. Benign osteoblastoma associated with an aneurysmal bone cyst of the mandibular ramus and condyle. Oral Surg Oral Med Oral Pathol 1993;76:433-6. 6. Gadre KS, Zubairy RA. Aneurysmal bone cyst of the mandibular condyle: Report of a case. J Oral Maxillofac Surg 2000;58:439-43. 7. López-Arcas JM, Cebrián L, González J, Burgueño M. Aneurysmal bone cyst of the mandible: Case presentation and review of the literatura. Med Oral Patol Oral Cir Bucal 2007;12:E401-3. 8. Pelo S, Gasparini G, Boniello R, Moro A, Amoroso PF. Aneurysmal bone cyst located in the mandibular condyle. Head Face Med 2009;5:8. 9. Matsuura S, Tahara T, Ro T, Masumi T, Kasuya H, Yokota T. Aneurysmal bone cyst of the coronoid process of the mandible. Dentomaxillofac Radiol 1999;28:324-6. 10. Jaffe HL, Lichtenstein L. Solitary unicameral bone cyst with emphasis on the roentgen picture, the pathologic appearance and the pathogenesis. Arch Surg 1942;44:1004-25. 11. James Ewing. Bone cystic lesions. In: En Ewing J de Saunders, editors. Neoplastic Diseases: A Treatise on Tumours. Philadelphia: Saunders Editores; 1940. p. 323-4. 12. Panoutsakopoulos G, Pandis N, Kyriazoglou I, Gustafson P, Mertens F, Mandahl N. Recurrent t (16;17) (q22;p13) in aneurismal bone cysts. Genes Chromosomes Cancer 1999;26:265-6. 13. Vicenzi G. Familial incidence in two cases of aneurysmal bone cyst. Ital J Orthop Traumatol 1981;7:251-3. 14. Leithner A, Windhager R, Kainberger F, Lang S. A case of aneurysmal bone cyst in father and son. Eur J Radiol 1998;29:28-30. 15. Kalantar Motamedi MH. Aneurysmal bone cysts of the jaws: Clinicopathological features, radiographic evaluation and treatment analysis of 17 cases. J Craniomaxillofac Surg 1998;26:56-62. 16. Kiattavorncharoen S, Joos U, Brinkschmidt C, Werkmeister R. Aneurysmal bone cyst of the mandible: A case report. Int J Oral Maxillofac Surg 2003;32:419-22. 17. Karabouta I, Tsodoulos S, Trigonidis G. Extensive aneurysmal bone cyst of the mandible: Surgical resection and immediate reconstruction. A case report. Oral Surg Oral Med Oral Pathol 1991;71:148-50. 18. Capote-Moreno A, Acero J, García-Recuero I, Ruiz J, Serrano R, de Paz V. Giant aneurysmal bone cyst of the mandible with unusual presentation. Med Oral Patol Oral Cir Bucal 2009;14:E137-40. 19. Peterson LJ, Indresano T, Marciani RD. Surgical management of benign nonodontogenic lesions of the jaws. Principles of Oral and Maxillofacial Surgery. Vol. 3. Philadelphia, Pennsylvania: Lippincott Philadelphia Editores; 1992. p. 733-40. 20. Hernandez GA, Castro A, Castro G, Amador E. Aneurysmal bone cyst versus hemangioma of the mandible: Report of long-term follow-up of a self-limiting case. Oral Surg Oral Med Oral Pathol 1993;76:790-6. Cristian Ra?iu,Aranka Ilea,Florin A. Gal,Flavia Ruxanda,Bianca A. Bosca,Viorel Miclau?